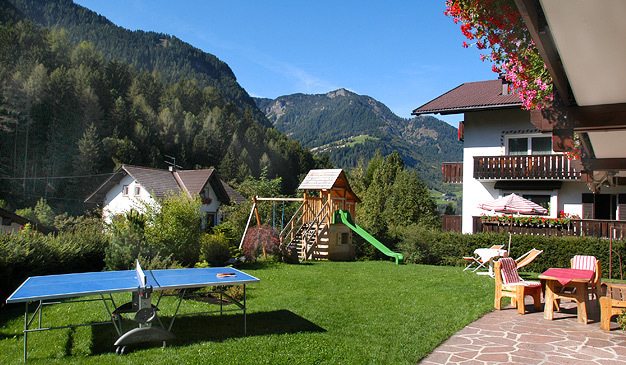 Our house is situated in a tranquil location, five minutes from the centre of Ortisei. Within spotting distance of our house you will find a bakery, a grocery store, a restaurant, a pizzeria a coiffeur and the skibus-stop (100m). This cable car also gives you the possibility to join the famous Dolomiti Superski carousel. Our apartments are furnished in country style and fully equipped with modern comforts. The apartments are available with one or two bedrooms, a comfortable livingroom with color tv and fully equipped kitchen. Every room has a shower, wc, hairdryer, safe and balcony. Bed-linen and towels are provided. We do also have a large playground with swing, slide, dollhouse and table tennis, a nice garden, a garage, loundryroom with iron and a skideposit with skiboot dryer.